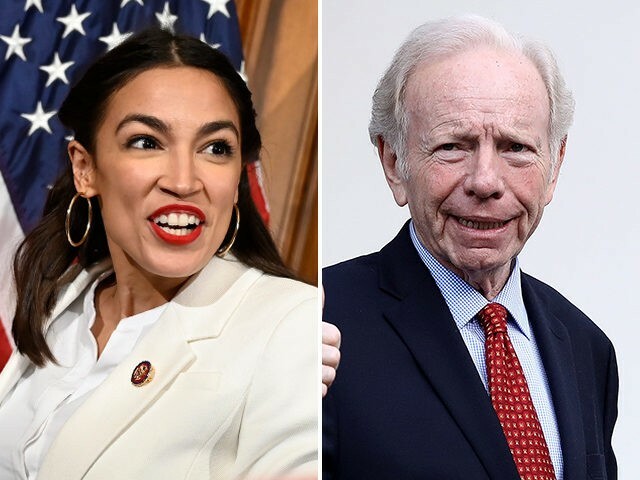 Rep. Alexandria Ocasio-Cortez (D-NY) mocked former Sen. Joe Lieberman’s position that the freshman congresswoman’s policies do not represent the “future” of the Democratic Party — the latest sign of brewing tensions between the party’s progressive and establishment members. In a Thursday interview with the Fox Business Network, Lieberman, who retired in 2013 after serving nearly 25 years in the Senate, poured cold water on Ocasio-Cortez’s ability to prosecute her progressive agenda. “With all respect, I certainly hope she’s not the future and I don’t believe she is,” the Democrat-tuned-Independent told host Neil Cavuto. On the subject of Ocasio-Cortez’s proposed 70% marginal tax rate to fund her “Green New Deal” — an economic stimulus program designed to transition the U.S. from fossil fuels to 100 percent renewable energy within 10 years — Lieberman said a progressive tax system already exists in the U.S.
“Who dis?” is a slang phrase deployed to avoid unwanted interactions through text messages by pretending that the messenger’s number is not tied to a name in one’s contacts. The latest zinger from Ocasio-Cortez comes as House Democrat leaders are expressing frustration with the freshman congresswoman’s repeated attacks on establishment lawmakers. Incumbent Democrats are perturbed by Ocasio-Cortez’s vow to help unseat moderate Democrats, who she, along with other progressive lawmakers and advocacy groups, see as roadblocks to enacting their far-left agenda, which in addition to the Green New Deal, including “Medicare for All,” the cancellation of all student debt, and the abolishment of ICE. Some Democrats, such as Rep. Yvette Clarke (D-NY), are pushing the 29-year-old to hold off on the attacks and try building bridges in her first term. “I think she needs to give herself an opportunity to know her colleagues and to give herself a sense of the chemistry of the body before passing judgment on anyone or anything,” Clarke said in an interview with Politico.